On last night's Rachel Maddow Show, guest host Alison Stewart talked with Nobel laureate economist Paul Krugman about the bent-knee bailout plea by auto industry execs, who arrived in Washington aboard private jets. Krugman argued in favor of the bailout, on the grounds that the economy, in its current state, could not weather the sinking of such a huge industry. But, he allowed, these execs "are not good guys." 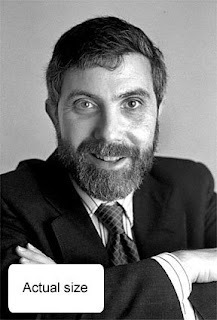 I agree with Mr. Krugman on both points. In a related story, I was walking home from work last night, and I had to cross a bridge. And Paul Krugman jumped up and refused to let me cross until I answered three riddles.